Moorcroft, Wyoming emerged out of the black just as my desperate quest to find a place to sleep birthed the recollection of Peter Fonda’s movie Race With The Devil. That movie is the sole reason I will never own an RV. I’m still searching for a place to safely catch some ZZZ’s because according to the map, Devils Tower is “nearby” so I figured I’d come across something eventually. 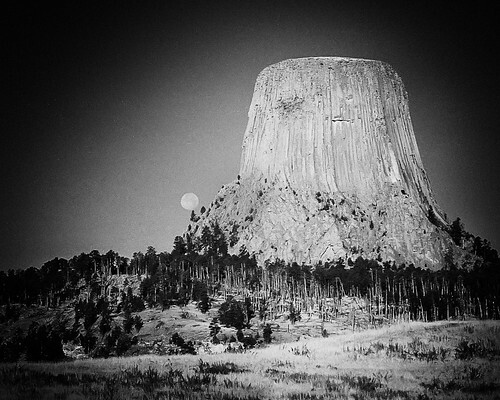 If you should decide to see Devils Tower, don’t make the same assumption. And don’t worry about the movie and the whole Devils Tower thing; it was filmed in South Texas. The Cozy Motel’s sign was half lit but the gravel parking area was packed with good ole boy pickup trucks - a sight that put me at ease. At least if some creepy-motel-located-in-the-middle-of-nowhere-Jason-scene occurred, my screams would be heard.